Should a Global Mustang Still Be Called a Mustang? 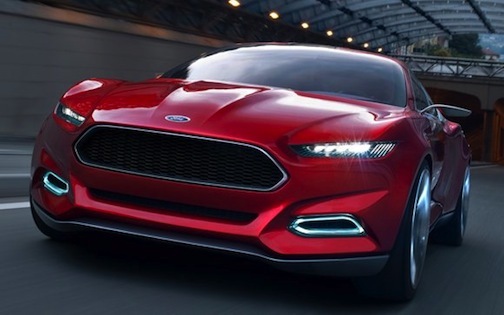 Ford Evos Concept: A preview of the 2015 Mustang? The Ford Mustang will soon turn 50 years old. In planning for the 2015 edition of the beloved and classic muscle car, Ford has some options. Option 1: Let the car finish out its natural life then fade into history, proud of the contribution it has made to American culture. Option 2: Carry on as usual, with a slight nip and tuck but no drastic changes, because Americans will keep buying it. Option 3: Completely redesign the car, throw out everything the Mustang has ever been and relaunch it to a worldwide audience. The Ford of the past would be perfectly content with option 2. Plenty of folks throughout the country surely believe the Mustang has run its course and deserves the dignity of option 1. Option 3, though, could be what’s in store. Readers of Popular Hot Rodding (after being directed there this week by Autoblog) were treated to an in-depth exploration of what the Mustang’s future holds. While there are no sources cited or quotes from executives who might know what’s going on, the story provides a compelling view into what, it claims, is the impending Mustang III. The gist of the article says a hybrid drivetrain is likely, along with an independent rear suspension (finally) and a whole new design language. Not surprising, and completely believable, is the indication that the performance coupe will be marketed in the U.K., Australia and Japan. But will the world embrace the Mustang? Australia already has the Ford Falcon. The U.K. is saturated with RWD performance coupes, and Japan, well, Japan prefers the likes of tuned Hondas and Toyotas. There’s a reason the Mustang has remained a U.S.-only love affair. No one else has wanted it. In order to appeal to a world market, there’s a huge chance that Ford will turn off its rabid American fan-base. By making such extreme changes, Ford might as well declare the Mustang dead and give this car an entirely new name and identity. Which option would you most like to see Ford use for the new Mustang: Kill it, keep it mostly as-is or change it completely? This entry was posted in Car Industry News, Car Magazines, Classic & Vintage Cars, Domestic Cars, General Chat, Hybrid Cars, United States and tagged 2015 ford mustang, Ford, Ford Mustang, global ford mustang, global mustang, mustang. Bookmark the permalink. Mustang is not only a great car name, it’s also an internationally-known name associated with american muscle cars. Even in Great Britain, Mustangs are collected and enjoyed. Ford would be foolish to retire the name. However, that said, Mustang has become synonymous with automotive dinosaurs, a great example of a car that seems produced mainly to fleece money from graybeards suffering from arrested development, graybeards that can’t afford a real life crisis in a Ferrari or even a vette. I would much rather see Ford turn the Mustang into a modern performance car. I really hope they don’t base it on something imported from Australia (like the Pontiac GTO) but come up with something much more sophisticated at younger people can embrace and enjoy. Can you imagine a mid-engine twin turbo v6 mustang with about 300 HP selling for under $40,000? No doubt, instead we will get some rehashed Vauxhall or Australian rear-drive model with more attention devoted to selling electronics than performance. The Current Mustang is suffering from bloat. Way too heavy, way too pricy.. Yes the increasing horse power is nice, but not at the cost of drivability. Ford, let’s go back to the trend of creating a cheap, fun car to drive with enough HP to kick some dirt and a raunchy exhaust. We don’t need a 1000HP Mustang (or 650HP for that matter). 99% of mustang owners don’t drag race their cars. Keep it simple, It’s the original pony car!, keep it powerfull & keep the power to the rear wheels , one more thing! make it look like a mustang, cuz the one on the photo looks more like a Jaguar. It honestly doesn’t matter what we say on this blog. Ford has teams of people who specialize in marketing and financial trends that will decide on a design based on what they predict will profit them more. Ford ALWAYS either try to go with a “classic” style like they did when the 2006 mustang first arrived or they will have an overhaul and completely new design like they did on the 2013 Focus and 2013 Fusion. One way or another our voice will have no influence unless they just have no clue what to do. If they actually change it to be a “modern” day car (meaning technology that has been available for years and years) I would actually respect it as a car. Anything after the original is a joke to a lot of people, due to its ancient technology and the poor performance compared to what other countries got. If a redesign happens, I may have to start respecting Mustangs, what a shocker. Same as above. In Japan, Mustangs are known and the older classic models are so beloved because of the size. I think it is better to have the RHD version which won’t be a big deal for Ford for the typical V8 models or say V6 if that will be the next hi-po motor looking to the future. Ford should keep the Mustang. It will become as the Camaro of Chevrolet. After all they had to bring it back. Mustang has been out selling the Camaro from day one and that won’t be changed. As far as Ford has no icon for the segment, just add the RHD and keep on produce it. Aussies, England and other nations such as Japan and other RHD nations will buy those. And even the total numbers will be much lesser than the LHD, still, Ford will not lose money but able to hold the good work horse name in their stake.